Erachi Puttu is a very recent addition in my breakfast menu and a much desired one these days. I have heard that it is popular in Malabar side. During one of our recent visits to Champakulam, we had lunch at Avees Puttu House in Alleppey – Changanacherry road. We ordered so many items but the best one was Erachi puttu. Loved the taste and combination and wanted to try it immediately when I reached Bangalore, and it was awesome. 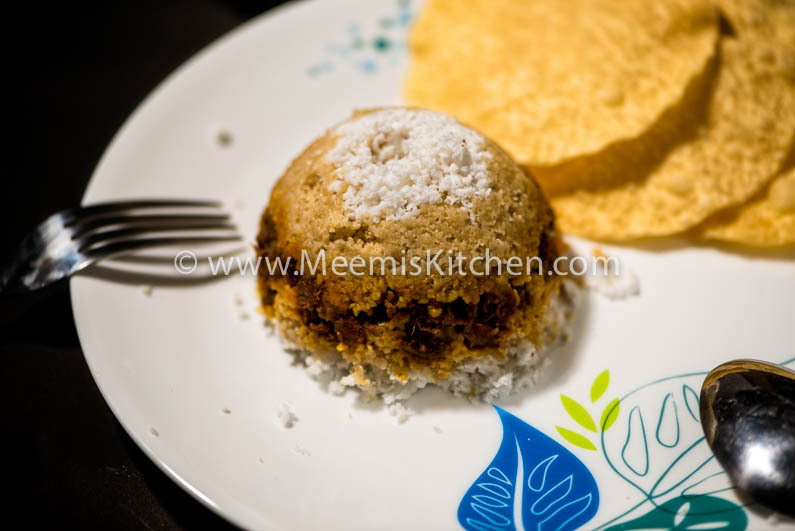 I tried many variations and Erachi puttu with Gothambupodi (whole wheat flour) is what we liked the most. You can try Erachi puttu with Rice powder or Wheat Powder to decide what works best for you. Keralalites love having variety breakfast like Appam, Idiyappam, Matta Ari Puttu, Dosas, Idli, Poori Masala, Upma, Rava poori with Kadala curry, Mutton stew, veal stew, Vegetable stew, Egg Roast, Chicken curry etc. Puttu had many transformations and vegetable Puttu, Chakka Puttu, Erachi puttu are all very popular these days.The main advantage of Erachi Puttu is that you can prepare the meat in advance and keep in the fridge. I have used Beef (Buffalo meat) but have tried variations with chicken and it is also nice. If you need a spicier version for preparing Beef filling, check my Spicy Beef Curry. Beef combinations like Beef and Beetroot, Kappa Biriyani, Beef and Vazhakka, Beef and mushroom are all very appealing like Erachi Puttu. You can try Erachi Puttu with Soochi gothambu (samba wheat) puttupodi as well. Whole wheat is nutritious and fibre rich so it is healthy too. I like Chiratta puttu or Puttu steamed in coconut shells. 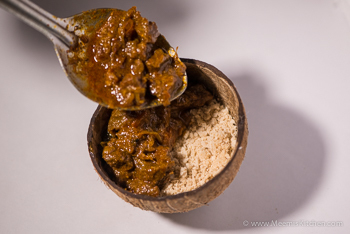 So if you are game, we will have a delicious breakfast or maybe dinner with Erachi Puttu. It is going to be a great happy day for your tummy; I can guarantee that much! . Cut the meat into very small pieces and clean and keep for draining. Heat the Pressure pan, Sauté sliced onions and slit green chilly, curry leaves in oil, add ginger garlic paste and stir fry for some more time. Add all the masala and spices and sauté for some time. Add chopped tomatoes and continue for another minute and add meat pieces and salt. Mix well and pressure cook the meat. There should be little gravy. 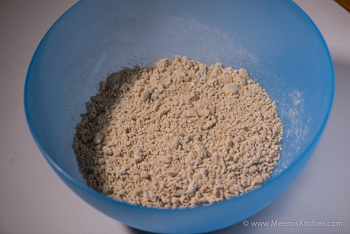 For Puttu, Take the wheat flour, add enough salt and sprinkle water on this. Stir with your hand in circular motion and sprinkle more water in between. The result should be like Bread crumbs (See pic). When you do with Rice flour you get the puttu without any lumps. But for Wheat flour you can see the lumps as it binds together easily. Just put little putt in a mixer grinder for two to three seconds and ‘voila’, the lumps vanish!! 🙂 Now to arrange, take the Puttu maker or Cleaned coconut shell, fill the bottom part with little grated coconut, then little puttu mix and layer with little meat in the middle and again top with Puttu mix and coconut. Keep it for steaming for 4-5 minutes and serve it on a plate with Pappadams. Yum.. Yum.. !! You can try with Rice Powder, which also tastes awesome. The meat should have little gravy. You can substitute beef with Chicken or Mutton (boneless) as per your choice. Be careful when you mix water to the Flour. Just Sprinkle so there are no big lumps. Move your hand in circular motion to avoid forming lumps. Hope you liked this recipe. Also check my Poori Masala, Pizza Dosa, Easy Palappam, Kallappam, Mutton stew, Veal stew and veg.stew recipes for other breakfast options. Let me know what your tummy says after this scrumptious meal. God Bless!! I tried with chicken & rice powder, it was so delicious..!! Thanks Sheena for trying. Great to know that you liked it. Dont hv words…erachiputtu ws super delicious. Thank you so much for trying out. Really happy to hear that. Thanks.